The Harumi apartments located in Harumi, an artificial island in Tokyo Bay were large - scale building along a north-east-west axis and south containing apartments that popular among the wealthy upper middle class. 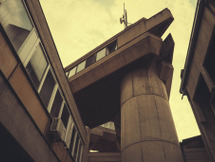 The floor plans was inspired by Le Corbusier housing unit in Marseille. 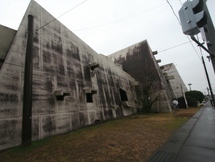 Mayekawa gave to the building a distinctive character, as expressing the construction of reinforced concrete in terms of heavy wooden structure. He also did not go for braces building with walls that expand in their approach to the ground, giving the building a greater sense of monumentality. The building was demolished in 1997.